In Swaledale, mountain rescuer Pete Roe is called to Tan Hill Inn, Britain’s highest pub, where a man has gone missing in freezing overnight temperatures. In the Lake District, Iona and Peter Frost-Pennington – owners of Muncaster Castle – are about to put 800 years of family history in the hands of first-year performing arts students at the annual Halloween festival. And at Bleak Bank farm in the Dales, will John Dawson be the final Dawson to work on the land? Opened in 2016, the Panama Canal expansion was an engineering project on a colossal scale. Hear how history’s pioneers shaped this modern-day feat. 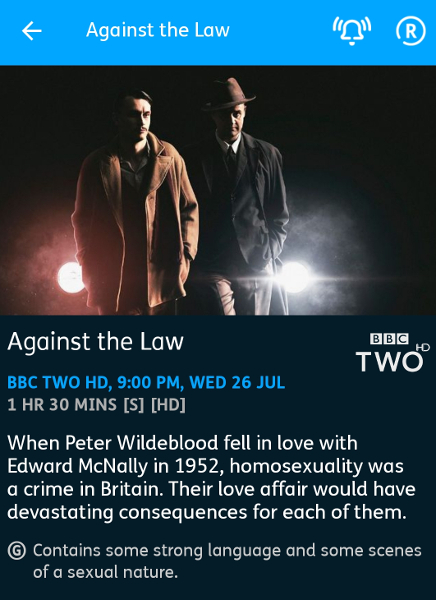 Powerful factual drama following the lead-up to the 1967 Sexual Offences Act, which decriminalised homosexual acts between adult males, in private, in England and Wales. The dramatic events that led to this Act took place over ten years before and are at the heart of this film. When Peter Wildeblood fell in love with Edward McNally in 1952, homosexuality was a crime. Wildeblood’s lover, under pressure from the authorities, turned evidence against him in the infamous Montagu Trial. Wildeblood and his friends were found guilty of homosexual offences and jailed. With his career in tatters and his private life painfully exposed, Wildeblood began his sentence a broken man, but he emerged from Wormwood Scrubs a year later determined to do all he could to change the way these draconian laws against homosexuality impacted on the lives of men like him. Woven through this powerful drama is testimony from a chorus of men who lived through those dark days. The building of this 3km-long bridge in Greece faced may obstacles – not least seismic activity. Discover how an improbable feat of engineering was accomplished. Presented by Stephen K Amos and Susan Calman, this series features LGBTQ people from across the UK as they share the objects that helped define their lives during the transformative 50 years since the 1967 Sexual Offences Act partially decriminalised homosexuality, offering lesbian, gay, bisexual, transgender and queer people the opportunity to start living openly for the first time. In episode one, these crowdsourced treasures range from a rare collection of the first openly gay magazine to letters from worried parents trying to understand their newly ‘out’ daughters and sons. Over the years 1967 to 1987, we meet the fearless revolutionaries of the Gay Liberation Front, a transgender pioneer who almost caused a strike and a woman who faced losing her children when she came out as a lesbian. By the early 1980s, LGBTQ people were starting to build a community, which would be tested to the limit when AIDS loomed. The world’s largest crane ship, the Pioneering Spirit can install oil pipelines in deep waters. Hear about the cutting-edge technology behind this project. The double Bafta-nominated series continues live on Friday nights for the 11th series with its unique brand of irreverent satire and sharp topical comedy. In this show John Cleese joins Adam Hills, Alex Brooker and Josh Widdicombe to examine the biggest and most entertaining news stories and rounds up the main talking points of the week. The Shanghai Tower is the world’s second tallest building and is designed to withstand earthquakes and typhoons. Learn more about this triumph of engineering.